I have a house rule—no turning on the oven from June till September. With the first day of fall and a somewhat cooler kitchen, I am so excited to roast a chicken again! Burnished roast chicken, an autumnal pleasure. 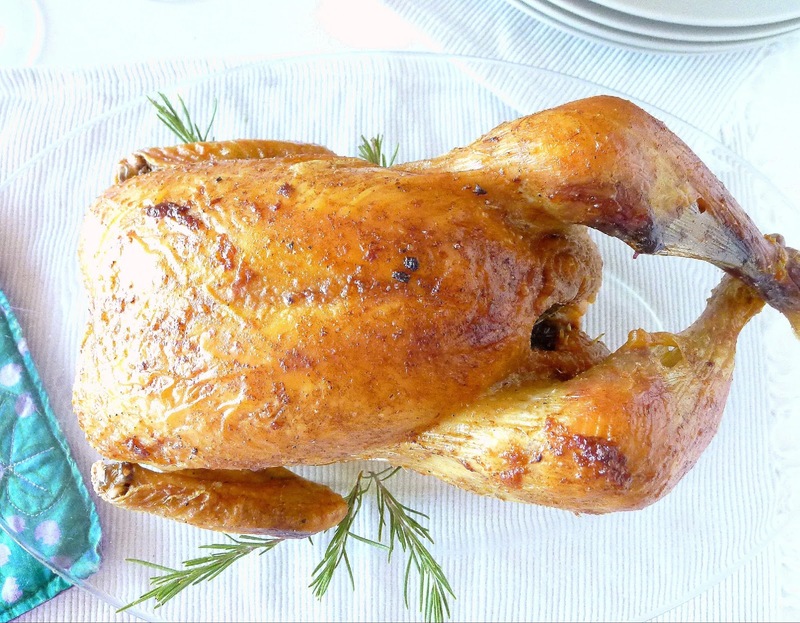 When my kids were growing up, roast chicken was a favorite easy, weeknight meal. While the boys were doing homework and baths, I would bung a whole, small chicken in the oven with nothing more than a scattering of thyme and chopped garlic, salt and pepper. In a little more than an hour, dinner was on the table. Now, I seek out free-range chicken, much larger than those battery-raised supermarket birds. They’re much more expensive and take longer to roast, so chicken is a special dish. The first day of fall also marks my switch from the chilled rosado (rosé wine) that I favour in torrid summer weather to tinto (red wine). 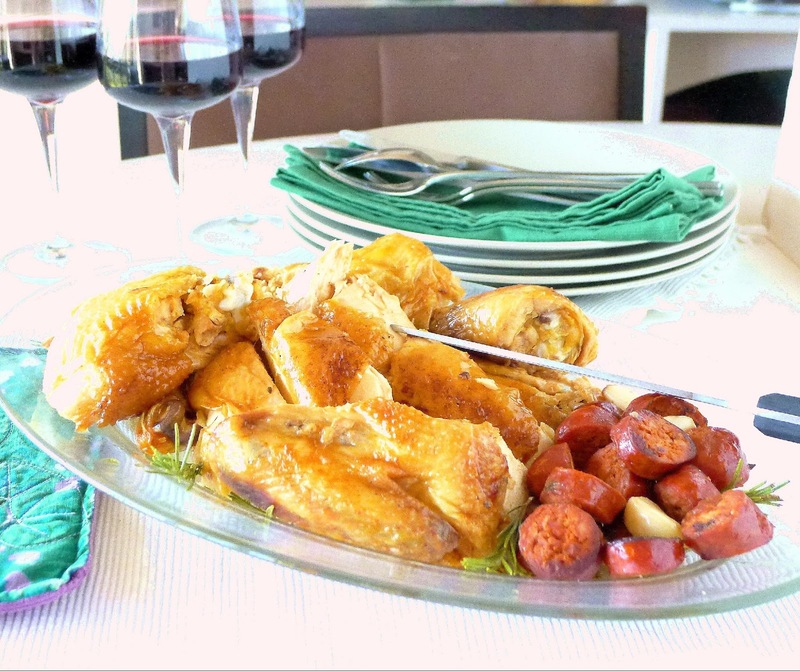 As I select a robust Rioja crianza—a red wine from La Rioja with a little time on oak (this one is tempranillo with a little garnacha), I recall that the most famous dish of La Rioja was the one that didn’t get eaten--a roast chicken set before the town magistrate of Santo Domingo de la Calzada back in the 14th century. The story goes that a youth who was traveling with his family on a pilgrimage to the holy shrine of Santiago stopped over at an inn in Santo Domingo and was framed by a scheming girl, possibly because he spurned her advances. The girl placed a piece of silver in his rucksack, then falsely accused the boy of thievery. He was sentenced and hanged for the crime. But his parents heard his voice calling out from the gallows, saying he was still alive. 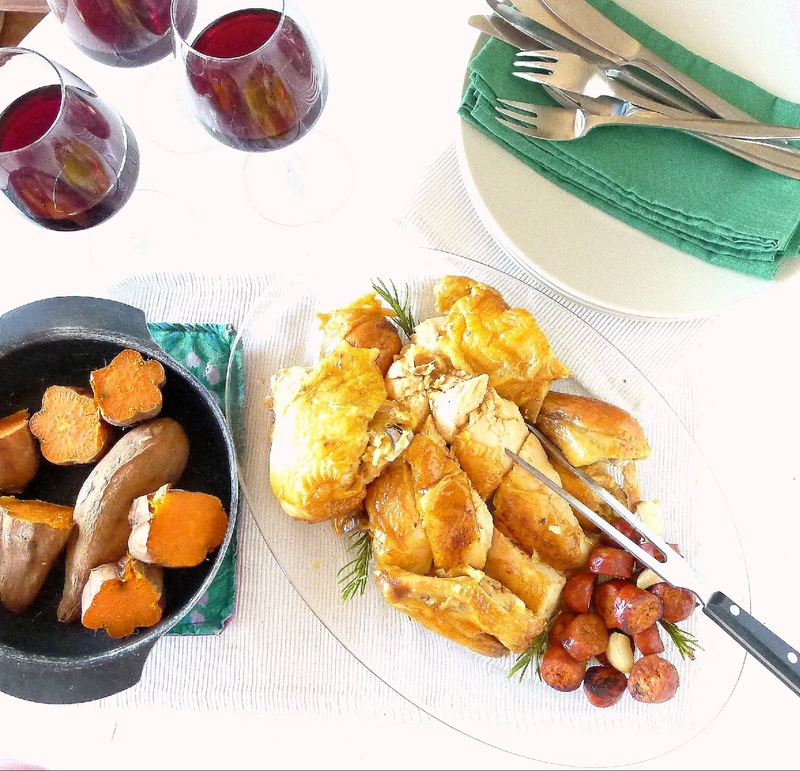 Dinner from the oven--roast chicken with chorizo and sweet potatoes. Pour some red Rioja wine to go with it. Chorizo sausage adds color and flavor to the chicken and pan sauce. La Rioja is also known for vivid displays of red choricero peppers hung from balconies to dry in the fall. These peppers are used for flavoring the region’s chorizo sausages. That gives me the idea to use chunks of chorizo to flavor the roast chicken. And, now that I’ve turned on the oven, I might as well roast some sweet potatoes, the first of the season. 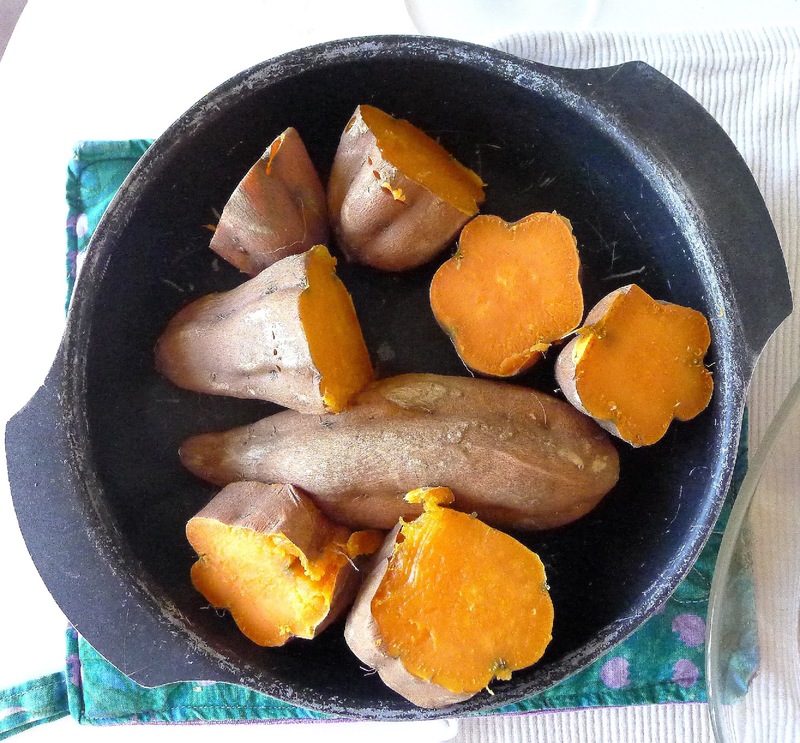 First of the season--locally-grown sweet potatoes. 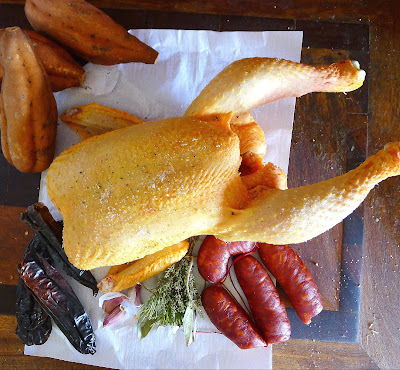 Roast chicken is juicy, basted with chorizo fat. Use chorizo link sausage, the slightly soft type that is best for grilling and stewing. (Dry-cured chorizo is best sliced as a cold-cut rather than used in cooking.) 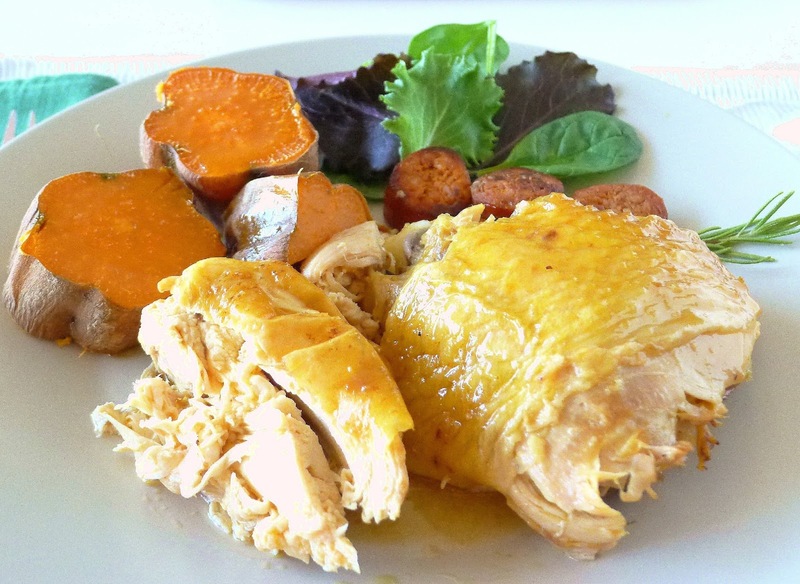 If chorizo is not available, use a spoonful of pimentón (paprika) mixed with olive oil for basting the chicken. 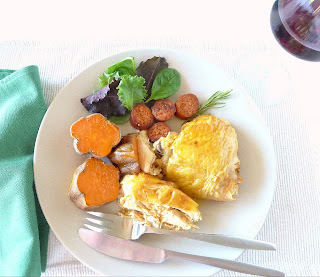 The pan drippings with chorizo fat are good spooned over potatoes or other vegetables. Herbs, garlic and chorizo are stuffed in the bird's cavity. On the left are dried choricero peppers, used to flavor chorizo. Sprinkle the chicken inside and out with salt and pepper. Allow to stand 30 minutes. Tie the bay leaves, thyme and rosemary into a bouquet and insert in the chicken’s cavity with the lemon slice and (unpeeled) garlic. Slice the chorizo. Heat oil in a small skillet and fry the chorizo, turning to brown both sides. Tilt the pan and skim out the chorizo. Save the fat in the pan. Use chorizo pan drippings to baste the chicken. Stuff the chorizo into the chicken cavity with the herbs. Tie the legs together and set in a roasting pan. Brush the chicken all over with the fat rendered from the chorizo. Roast 30 minutes. 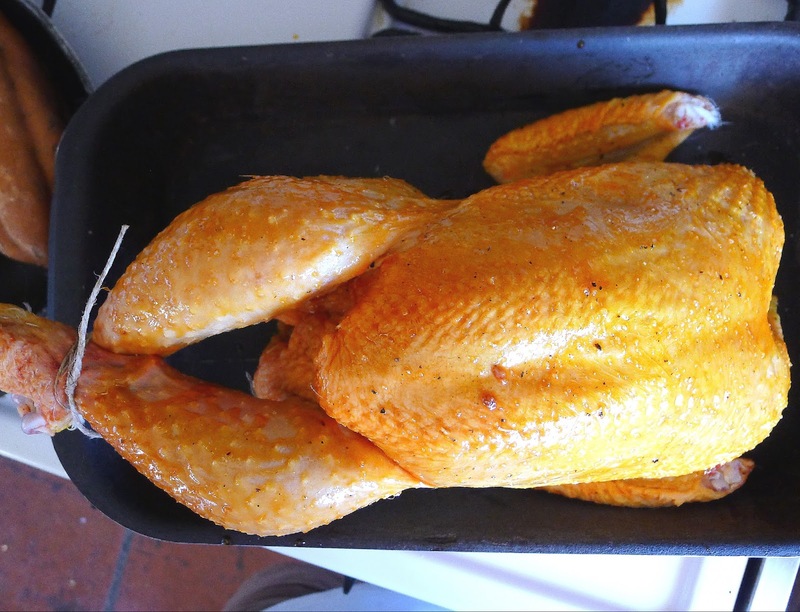 Baste the chicken with pan drippings. Lower oven temperature to 350ºF. Roast 30 minutes more. 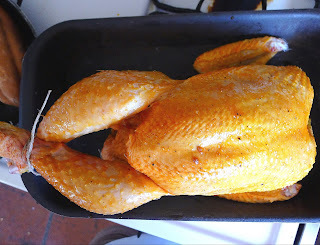 Baste the chicken again with pan drippings. Pour over the wine. Roast chicken 30 minutes more or until juices run clear. Remove chicken to a platter or cutting board and allow to rest 15 minutes before carving. Discard the bunch of herbs. Place the chorizo on serving platter with the chicken. Peel the garlic cloves and use them as garnish. Serve the pan juices in a separate bowl. A one-mango tree in my garden. 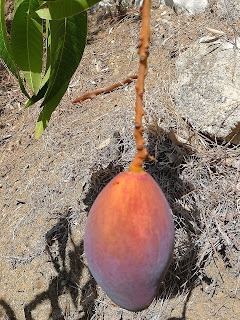 In my garden is a small mango tree that finally delivered a single fruit. I picked it when it looked “ripe”—blushed with color—and allowed it to soften in the fruit bowl. Then I ate it all up. My mango was juicy, sweet and ever-so-fragrant. And quickly gone. Luckily, it’s mango season in Málaga right now. I’m buying local fruit and using it in many ways, besides just eating it out-of-hand. Locally-grown mangoes in a nearby supermarket. 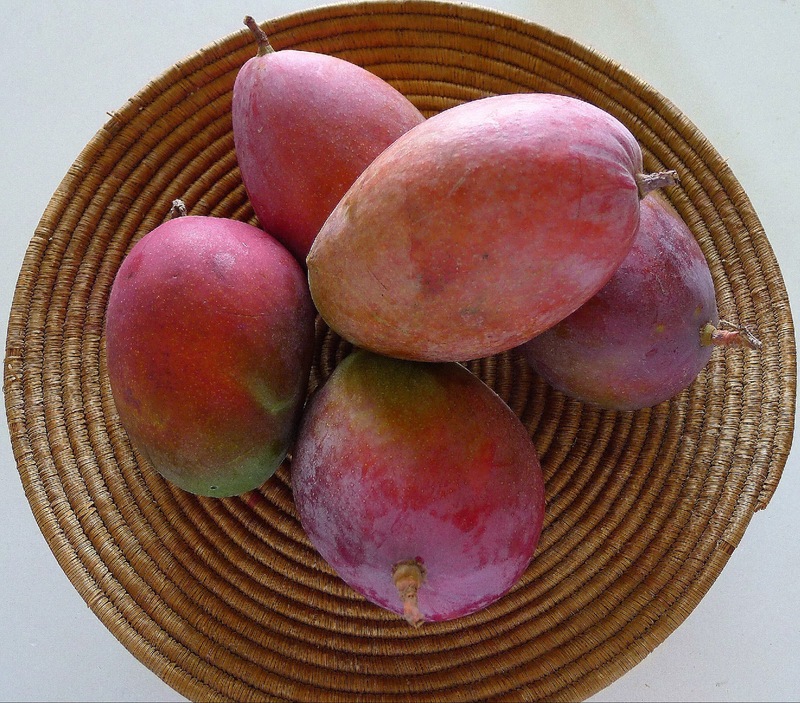 Mangoes are not native to Spain. In fact, they are very late arrivals. But the southern-most coast, east of the city of Málaga, enjoys a sub-tropical climate. Avocado plantations were established there back in the 1960s. 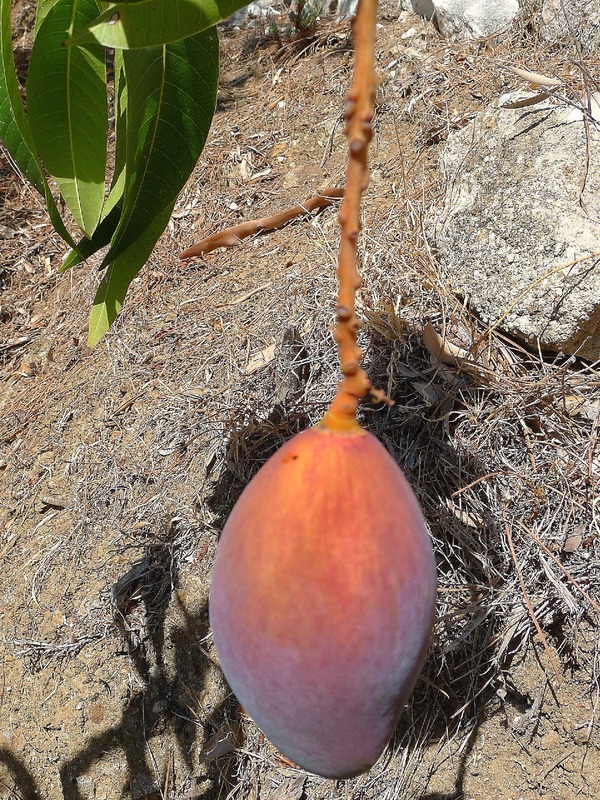 Now mangoes are moving in, proving to need less water and produce more fruit per hectare* than avocados (one hectare produces 20,000 to 30,000 kilos of mangoes). According to a recent newspaper report on this year’s harvest, the season will end in November with about 20 million kilos of mangoes. 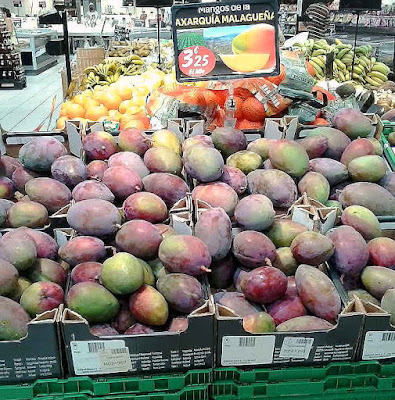 Mangoes from Málaga enjoy an excellent reputation on the export market, as they are picked when sugar levels are high enough to assure good flavor. One of the main varieties is the Osteen. These crimson and green fruit have wonderful flavor and are not overly fibrous. These average about 15 ounces. 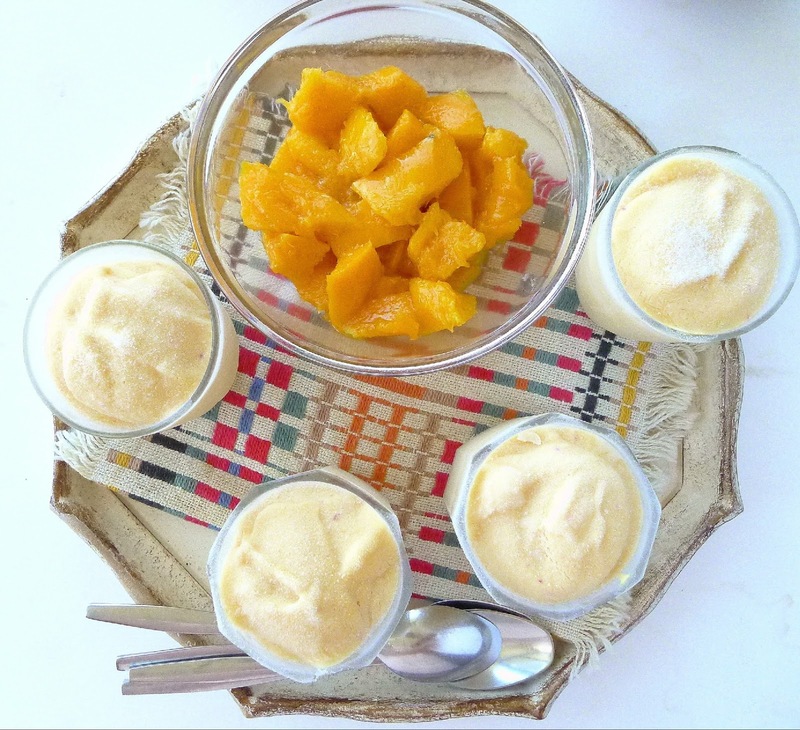 Indulging my mango mania, I found many ways to use them, most with a Spanish accent. 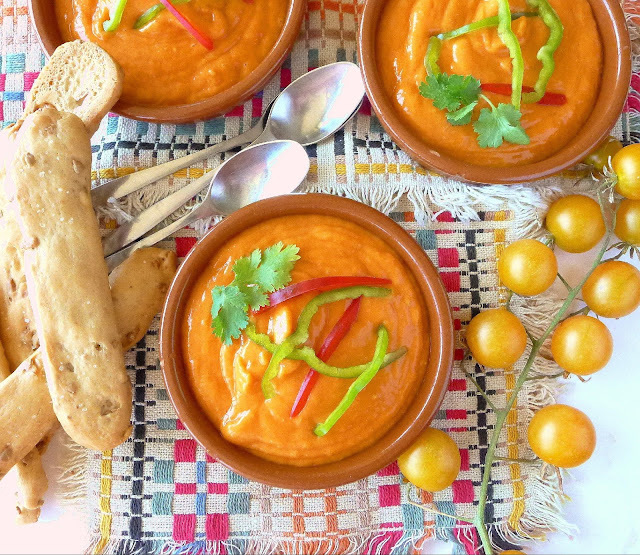 A traditional porra--thick gazpacho cream--made with mangoes as well as tomatoes. Paella rice with shrimp and mango sauté. 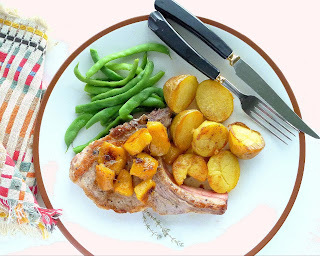 Pan-fried ibérico pork chops with sautéed mango. 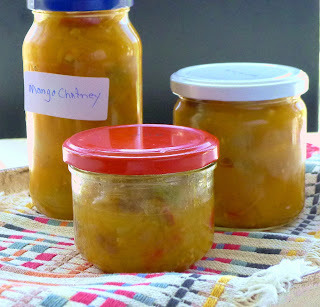 Mango chutney goes with roast lamb. Porra is tradtionally garnished with strips of ham. Porra is the Málaga version of salmorejo, as it is known in Córdoba and Sevilla. It’s basically a very thick gazpacho of tomatoes, bread, garlic and olive oil, more of a cream than a soup. I’m jazzing it up by using mango as well as tomatoes and adding a bit of cumin and cayenne. The mango gives the porra a mysterious fruitiness. Traditional porra is served garnished with serrano ham, canned tuna and/or chopped hard-boiled egg. Spanish ham seems especially good with the mango. Serve porra as a starter or light lunch. 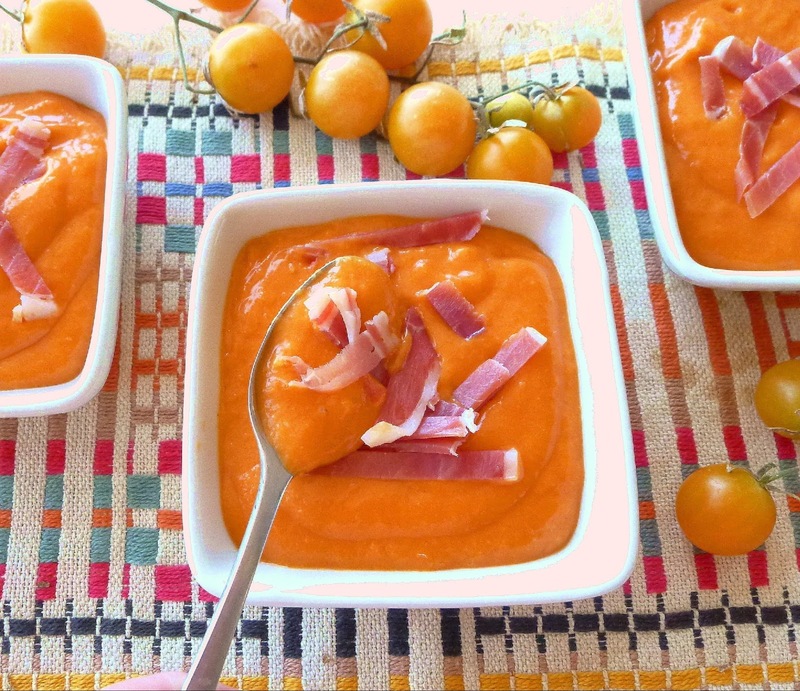 For a smooth gazpacho cream, either puree the tomatoes and sieve them or else peel the tomatoes. Let bread soak up juices from tomatoes. Place the cubed bread in a blender. Add the tomatoes and mango and ½ teaspoon salt. 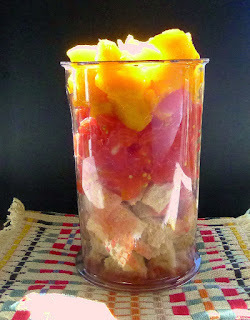 Allow to stand at least 30 minutes, so the juice from tomatoes and mango begins to soften the bread. Add the garlic and blend the bread, tomatoes and mango until smooth. With the blender running, add the oil, vinegar, cumin, cayenne and additional salt to taste (about ½ teaspoon). Chill the cream. 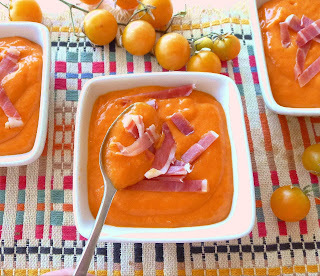 Serve the gazpacho cream in shallow bowls, garnished, as desired, with strips of ham, red and green pepper. 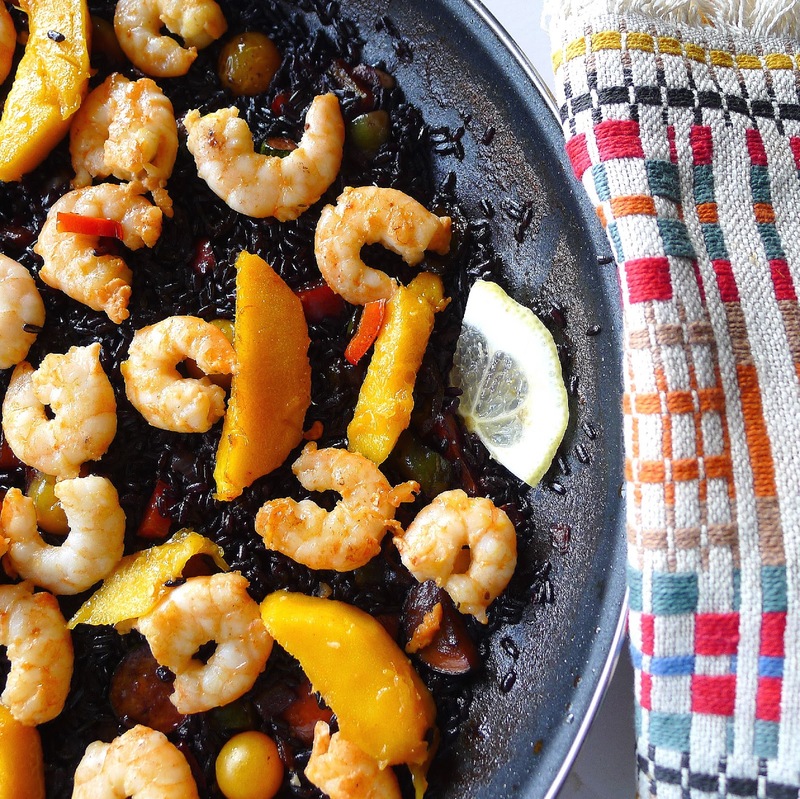 Sautéed shrimp and mango tops savory paella-style rice. This is a paella-style rice. 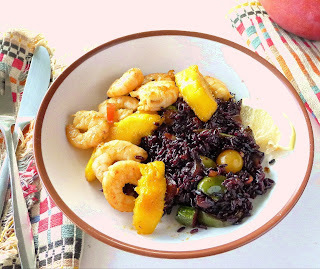 For dramatic effect, I used a par-boiled (“converted”) black rice. White rice is fine. Choose a round, medium-grain one, the sort used for paella. If possible, start with whole shrimp with heads and tails (about 1 ¼ pounds). Peel the shrimp, reserving the bodies. Fry the shells and heads in 4 tablespoons olive oil. Skim out the shells and place them in a pan. Save the flavored oil for preparing the rice. Add 4 cups of water and 1 teaspoon salt to the shells and heads in the pan. Bring to a boil and simmer 30 minutes. Strain and reserve the broth for cooking the rice. (Discard the shells.) If you don’t have shrimp heads and shells for making broth, use chicken stock. Use firm, slightly under-ripe mangoes for this dish. Heat the oil in a paella pan or large skillet. Sauté the peppers, onion and garlic until softened. Add the tomatoes, zucchini and rice and sauté 3 minutes. Add the saffron and wine. Bring to a boil. Add the shrimp broth or chicken stock and salt to taste (if broth is salty, the rice may not need additional salt). Bring to a boil, then reduce heat and simmer until the rice is tender, 18-20 minutes. Heat the oil in a medium skillet. Add the garlic. Before it browns, add the chile and shrimp and sauté, turning, until shrimp is pink. 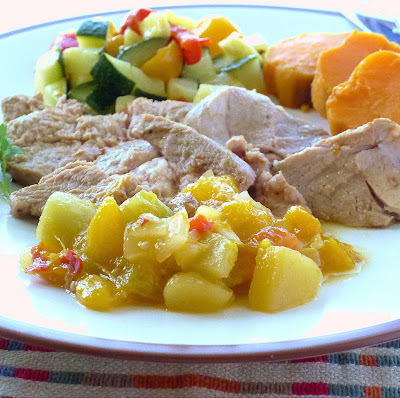 Add the sliced mango and sauté it briefly. 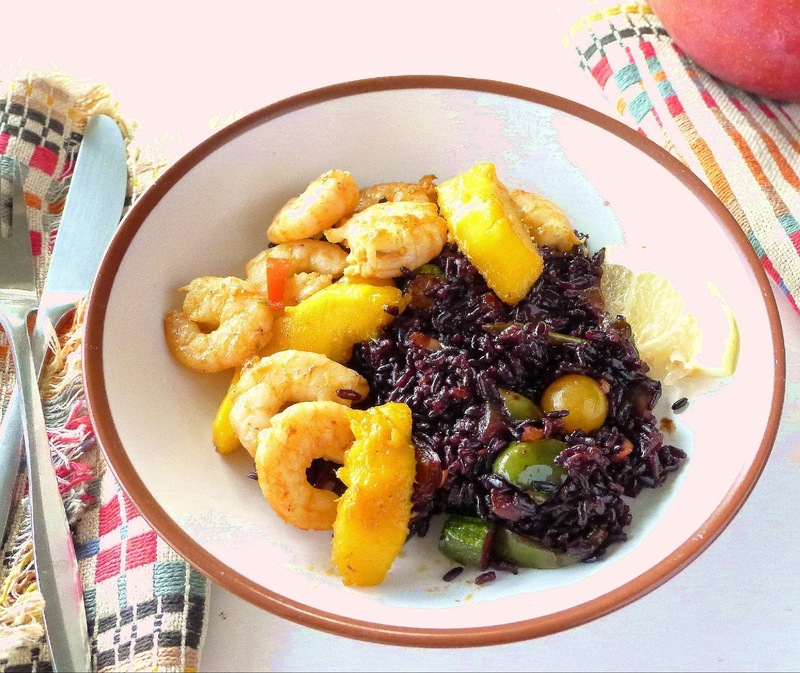 Spread the shrimp and mango on top of the rice. Garnish with sliced lemon. 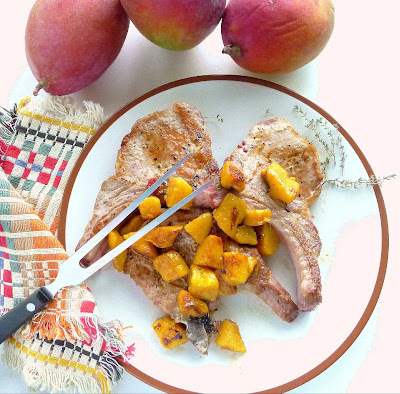 Chunks of sweet mango sauté in the same pan as the chops. 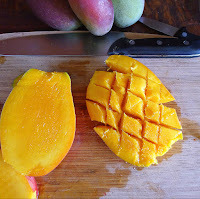 To cut-up mango: Slice it vertically off of the center pit. Cut the flesh diagonally without cutting through the skin. Push the skin side to open up the cuts, then cut the cubes free from the skin. How to cut-up a mango. Season the pork chops with salt, pepper, thyme and garlic. Allow to stand for 30 minutes. Heat the oil in a skillet and brown the chops on both sides. Remove to a plate. Add the mango slices to the skillet and brown them lightly. Add the wine and return the chops to the pan. Simmer until pork is just cooked through. Chutney is such a versatile condiment. Serve it with a holiday roast turkey, with roast lamb, on toasts spread with cream cheese. I make chutney in small batches that keep in the fridge for a couple months. I use stevia, a sugar substitute, instead of sugar. The chutney doesn’t become as syrupy as it does with sugar. Put all the ingredients in a pan. Bring to a boil, then simmer, uncovered, until fruits are tender. 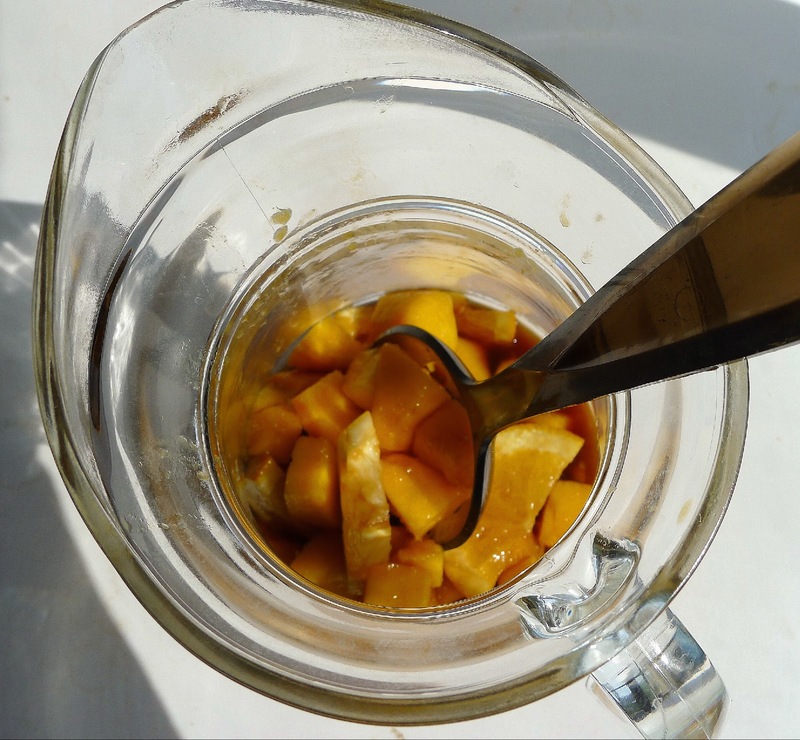 Ladle hot chutney into sterile jars and seal. When cool, refrigerate the jars. Macerate the fruit in sweet wine. When cutting up the mango, be sure to squeeze all the juice from the fibrous flesh surrounding the pit. Add the juice to the cut-up fruit. The fruit macerates in a sweet Pedro Ximenez Sherry (PX), so it does not need extra sugar. 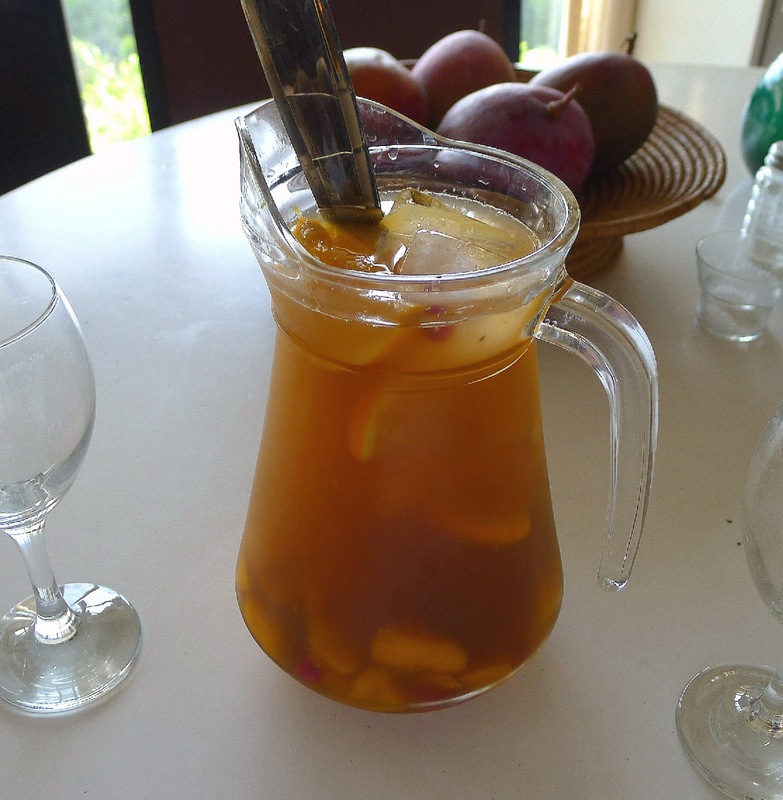 Place the fruit in a pitcher and add the PX Sherry. Let the fruit macerate at least 30 minutes and up to 3 hours. Immediately before serving, add the wine, fizzy water, lemon verbena, if using, and ice cubes. *A hectare is a metric measurement equivalent to 10,000 square meters or 2,471 acres. Año de higos, año de amigos. 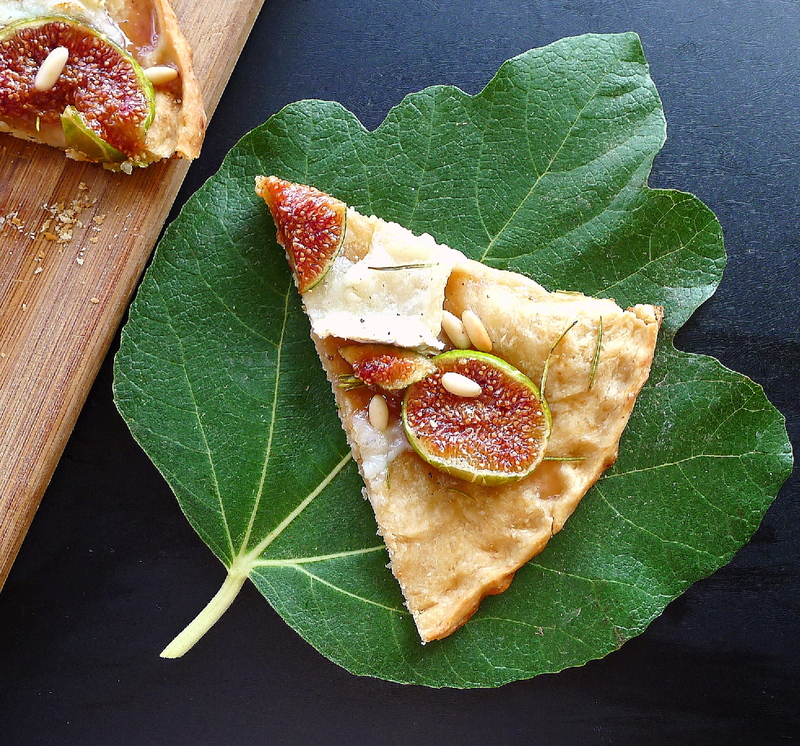 "A good year for figs is a good year for friends," is a Spanish folk saying. If there’s any truth to this wisdom, I should be surrounded by friends, for I’m posting a second round of fig recipes and may go for a third (dry ones, around Christmas time). 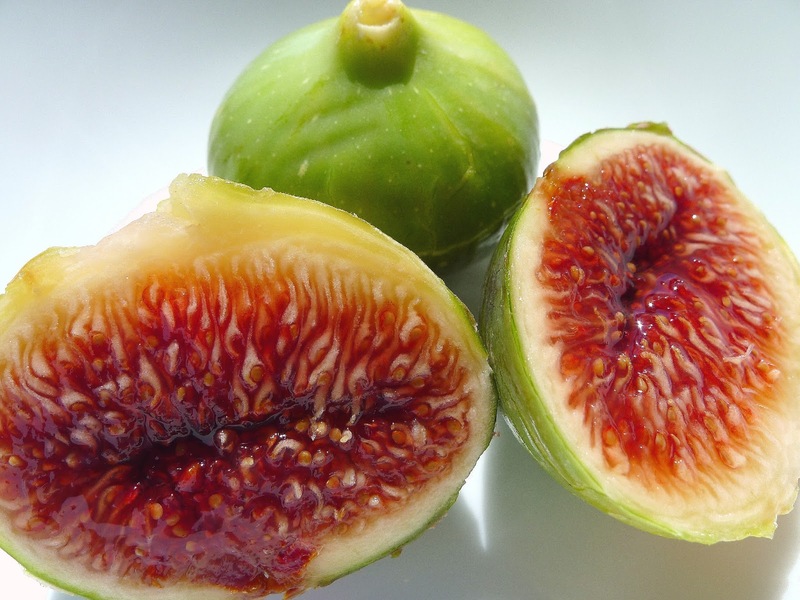 The first figs are brevas that mature in early June. 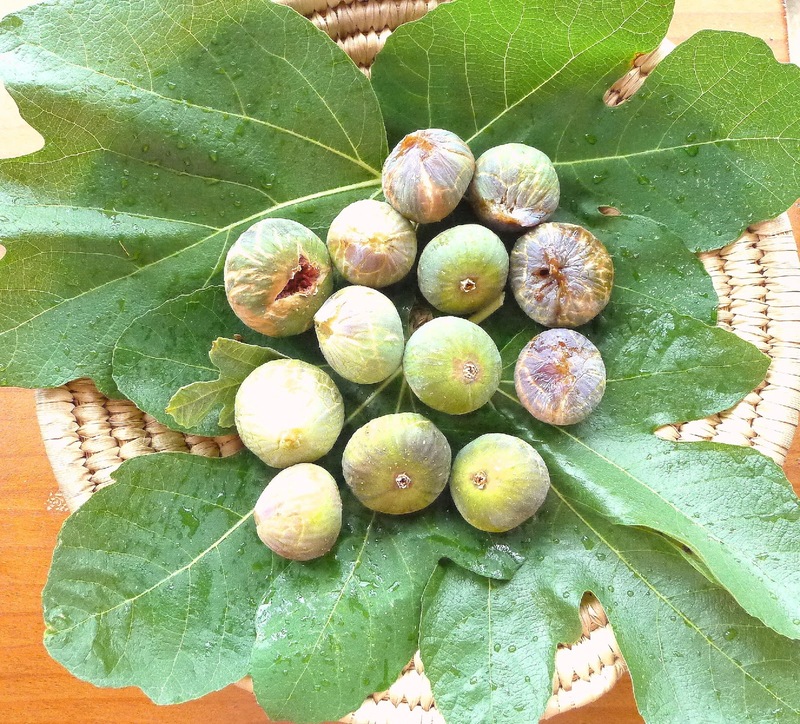 The fig tree then produces a second crop at the end of summer. That’s what I’m picking now. 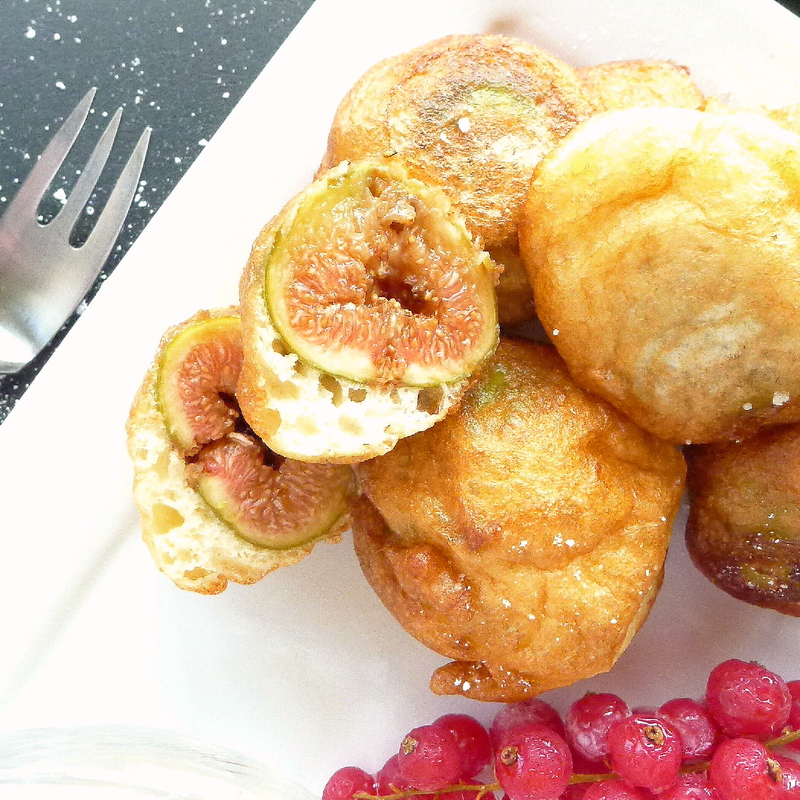 I love figs, for breakfast or dessert, chilled and quartered, served with a dollop of Greek yogurt. I like them pureed and folded into a mousse or panna cotta (see this recipe, which can be adapted to figs). I'm looking through my recipe files to find some new ways to prepare them. Here are two. 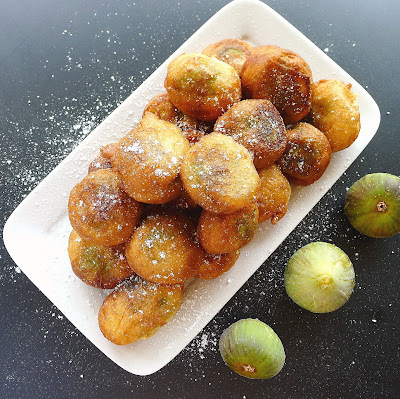 Figgy fritters. Fresh figs are dipped in a fritter batter and deep fried until golden. 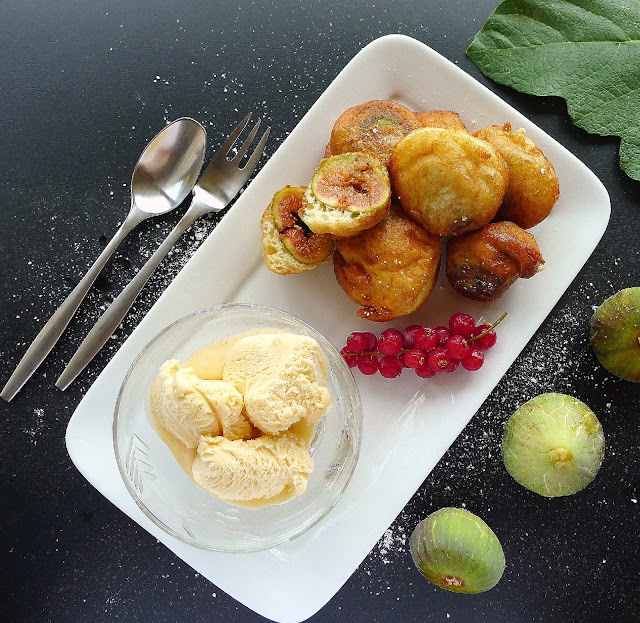 Serve the fig fritters alongside ice cream. Fritters are juicy on the inside, crisp on the outside. Coca is a flatbread, somewhat like pizza. Here, with sliced figs, goat cheese and pine nuts. 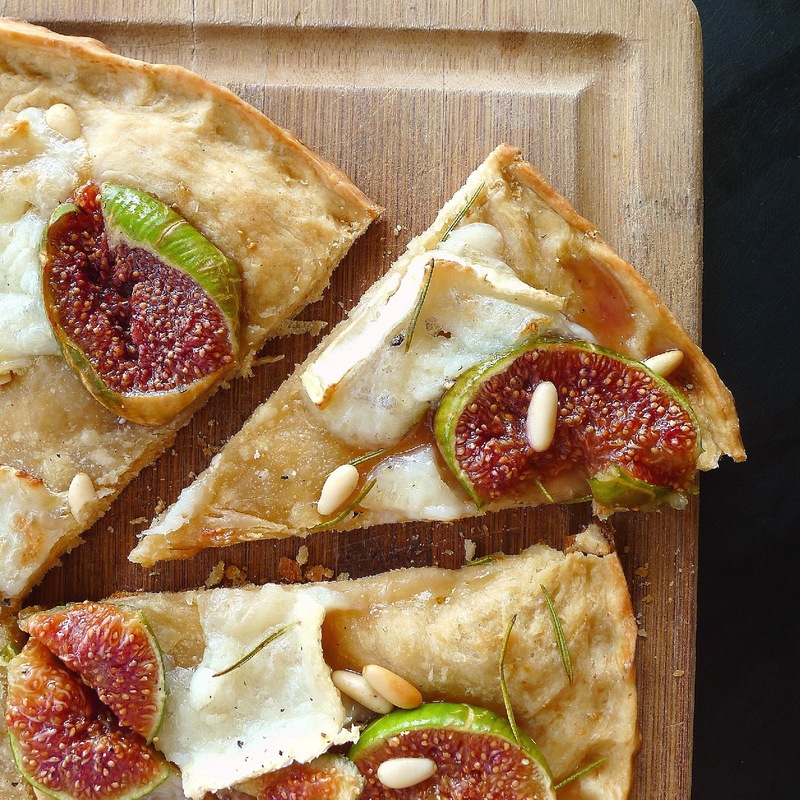 Use sweet, ripe figs that are still firm, not squishy. Whole small ones are best. If large, cut them in half or quarters. The fritter batter can be used for dried figs as well. Plump them in muscatel wine or brandy before dunking in the batter. The batter also serves for making any fruit fritter—banana, apricot, apple. The fritters don’t have to be served hot, but they are best enjoyed within a few hours of frying. If you would like a sauce with the fig fritters, try melting red currant jam with a little brandy or topping with a dollop of Greek yogurt. Ice cream is a nice accompaniment to the fritters. Wash the figs and pat them dry. Cut away any hard stems. Place the egg yolk in blender with the oil, sugar, milk, salt and lemon zest. Blend until combined. Add the flour and baking powder and blend until smooth. Refrigerate the batter for 1 hour. In a clean bowl, beat the egg white until stiff. Beat in the lemon juice. Place the batter in a mixing bowl. 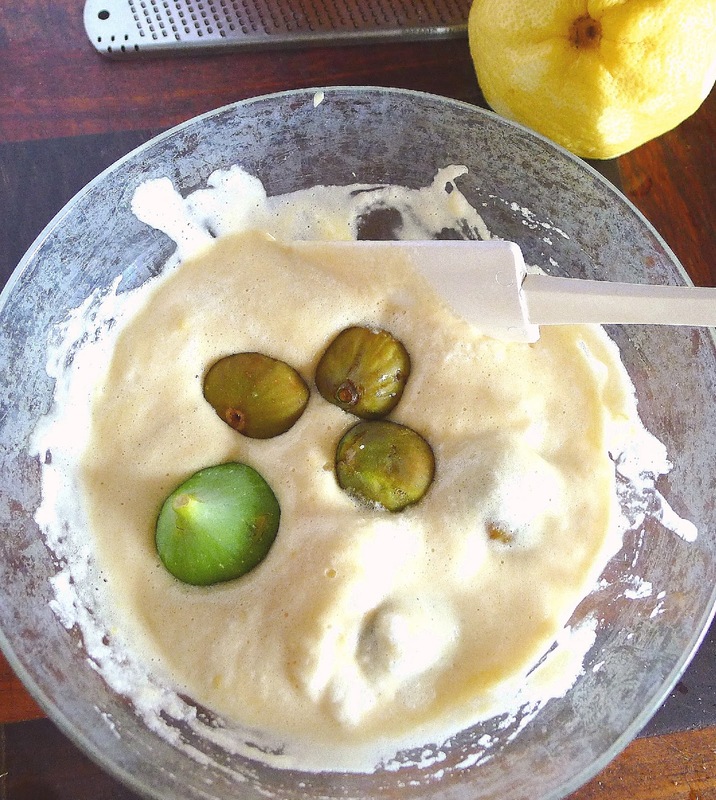 Beat in a spoonful of the beaten egg white, then fold the remaining white into the batter. Heat 1 inch of oil in a deep skillet until shimmering, but not smoking (360ºF/ 180ºC). Drop the figs into the bowl of batter and carefully fold them in so they are coated. Use a tablespoon to lift figs and place them in hot oil. When golden-brown, carefully turn the figs to brown the reverse sides. Use a heat-proof slotted spoon to lift them out of the oil. 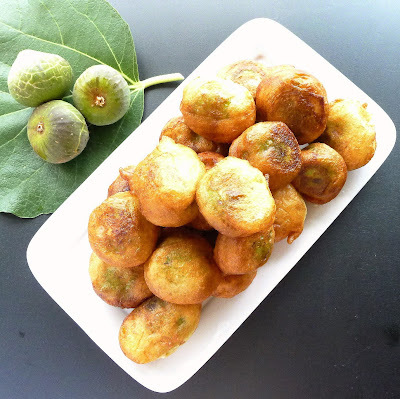 Drain the fig fritters on paper toweling. Serve sprinkled with powdered confectioners’ sugar. Coca is a flatbread with toppings, sort of a cross between pizza and focaccia. The coca (plural is coques in Catalan or cocas in Spanish) is made from bread dough. 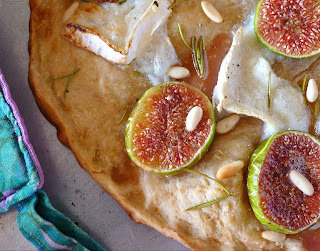 Use any favorite pizza dough (or see the recipe here ). I like a thin, crisp crust, so I rolled the dough out as thinly as possible. I used a log of soft French-type goat cheese. Roll or pat the dough to a 10-12-inch circle. Place the dough on a baking sheet or stone. Brush it with oil. 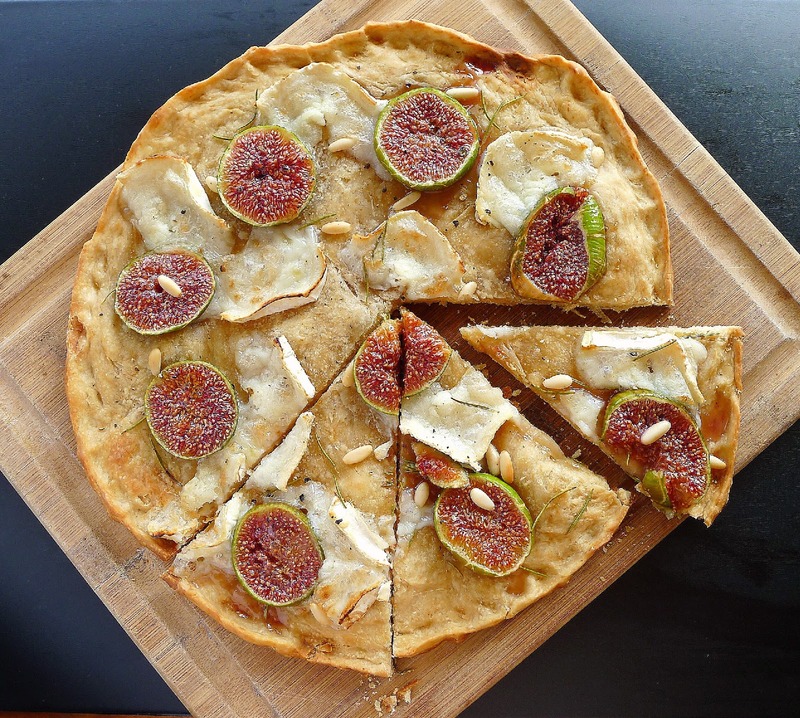 Place slices of cheese and figs on top. Scatter pine nuts over and add small sprigs of rosemary. Grind pepper over all. Bake until the edges of the pizza are browned, about 20 minutes. Serve hot or room temperature.